Welcome to a fresh new year! We hope you all had a restful and rejuvenating break. You are among more than 2200 eSmart schools across Australia, who are implementing our evidence based program and we look forward to continuing to work with you again. We have a team of eSmart experts to help you at every step of the way. They are available across the week to assist you in implementing the Framework. Meet our Education and Community Advisors. All are qualified teachers with varying experiences over the years with a specific interest in cyber safety and the wellbeing of Australian children. We welcome your feedback on how we can improve our service, cyber events and resources by emailing or calling us on 1300 592 151. Congratulations to the first eSmart School in Tasmania! As thousands of Tasmanian children start a new school year, Snug Primary School, a semi-rural school south of Hobart, has become the first in the state to achieve eSmart status! 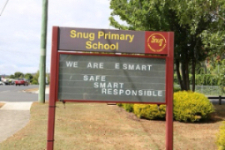 Click here to find out why Snug Primary School wanted to become and eSmart School. We have updated and remodelled our scope and sequences to align with changes in curriculum and to add new links and resources. You will notice that there are a few new sections that we hope you will find useful. Click here to see our updates and new additions. In 2017, the Foundation launched its own expert speaker bureau, called ‘Connect’ designed to help upskill communities in relation to cyber safety, bullying and the impact violence has on children and young people. The workshops complement the work schools currently undertake as an eSmart School. More than 360 sessions were delivered in 2017 and we are delighted to announce there are solid bookings for 2018. Find out more about Connect how it can assist with your eSmart journey. Matt Handley, from St Peter Julian Eymard School, Mooroolbark, VIC has lead efforts to create resources for students and staff that relate to creating a process for reporting incidents by students and staff [Domain 1], as well as age appropriate 'acceptable use' agreements [Domain 2]. Read the full case study here. We are always looking for volunteer eSmart schools coordinators [with student input perhaps] or Principals or other staff members to showcase in our Case Studies and possibly partake in one of our cyber safety events. If that is you or you know of another staff member that would be able to do this, please fill out the Word document directly and send it to us, or email us. Read and share with the parents at your school some tell-take signs a child is being bullied - from Sandra Craig, Manager, National Centre Against Bullying (NCAB) and Senior Advisor. Does your school have the eSmart Digital Licence? Assisting both domains 4 & 5, the eSmart Digital Licence is a fun and engaging online program that prepares children to be smart, safe and responsible digital citizens. Purchase 25 or more licences now to receive your Immersion Pack to assist in engagement and spark crucial conversations with your students. On Friday 16 March 2018, Australian schools will stand united in their communities to celebrate the eighth National Day of Action against Bullying and Violence (NDA), Australia’s key anti-bullying event for schools and in 2018. Schools are called to imagine a world free from bullying and share their BIG IDEAS. The Alannah & Madeline Foundation would love to see you share your big ideas using the following hashtags on Facebook, Instagram and Twitter! eSmart membership is an online community exclusive to eSmart schools who have completed the Framework and are eager to continue implementing an outstanding eSmart culture. Members will receive additional benefits and stay up to date with the latest research, advice and trends. Click here for a full list of benefits and costs. Log in to your existing eSmart online system tool to see if you are eligible.